Hanoi`s “selfie street” is in the Old Quarter, along a set of train tracks originally built by French colonists. “Selfie-takers can sometimes annoy locals as they block off sidewalks to get the perfect photo, there’s bigger issue at play here in Hanoi – the train tracks are very much still operational, meaning that locals and visitors alike can risk their lives by not being careful when they stand on or walk across the tracks” reported US news-based pay television channel CNN. According to Christabel, an Instagrammer, the locals were super-friendly and they did mention the train times when tourists walked past. “A quick social media search shows photos of visitors sitting, running, jumping, dancing, kissing, pretending to fall and even planking along the tracks. Only a handful show an actual train going by,” CNN wrote. Dave Fox, a Vietnam-based writer and writing coach advises travelers that they need to be mindful of optics, it’s fine to take people’s photos if you ask first and most people in Vietnam are nice. You need to treat people like human beings, not objects in a museum, he said. Earlier, The Times of India, an Indian English-language daily newspaper, has picked three reason to make railway track in the middle of a residential colony become the new attraction in Hanoi. 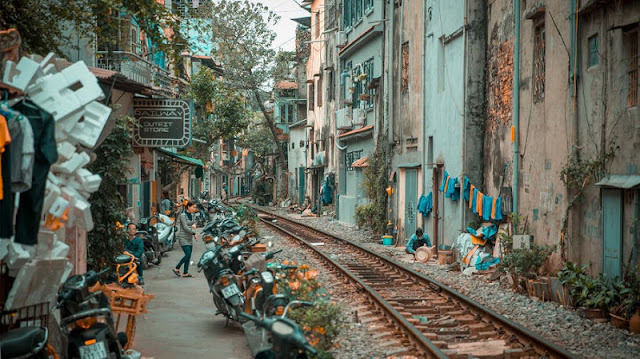 According to The Times of India, one of the reasons is the Train Street in Hanoi. It is a humble, narrow residential strip with a railway track passing through its center. In addition, the daily also picked a normal day on the Train Street as one of the reason why should visitors choose it. The third reason is the way to watch the trains at the Hanoi Train Street.